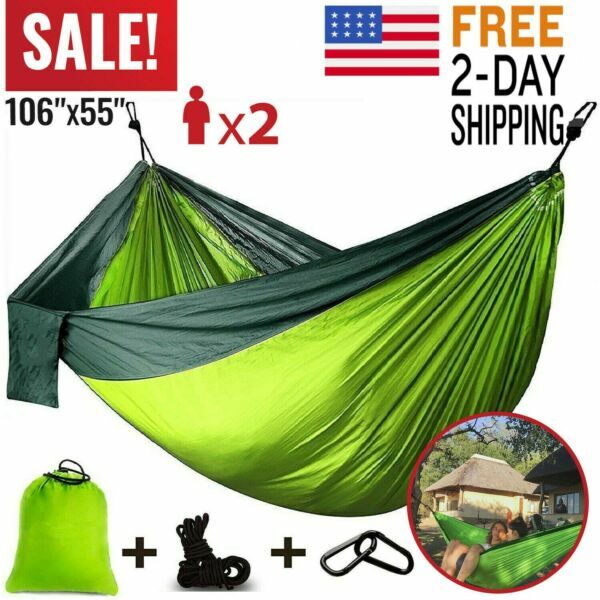 eBay Camping Hammock Double Two 2 Person Parachute Tent Hiking Travel Outdoor DurableFree 2-Day ShippingA great gift for traveling, camping, backpacking, or just hanging it and relaxing on it in the patio. This camping hammock is lightweight, easy to pack, and comfortable for sleeping. The camping hammocks can be a cozy place to lay your head at the end of a long day.Features:SPACIOUS & STRONG: Each tree strap can protect the tree from injury by the rope when you enjoy the hammock. This double hammock fits 2 persons, You can lay down with your friend or loved one and you will still have plenty of room. The double hammock can safely and easily support the maximum capacity of 600-700 LBS.WIDE USE: The ends of the hammock could be released to turn it into a "blanket”, “filed mat”, “tent". SET UP DISTANCE：The minimum distance between two trees is about 110'', the maximum distance is about 177''.MATERIAL: Our hammocks are made of 210T Parachute Nylon as the main fabric, the same material that skydivers trust with their lives. It is held together with triple interlocking stitching for superior strength. This allows the hammock to be super strong, extremely lightweight, breathable, durable, and fast-drying.EASY SETUP: It only takes a few seconds to unfold from the package. One person can also install it, and it takes only three to five minutes to set up. Once done, just fold and pack it back up into the pouch/carry bag. Easy peasy! !CLEANING: Machine washable. Since the Hammock is made of breathable 210T nylon parachute material, it quickly dries after being wet. Silky soft and mildew resistant.Package Includes:1 Double Camping Hammock 106” (Length) x 55” (Wide)2 Tree friendly straps2 Solid Carabiners 1 Carry/Storage BagIf you have any questions, PLEASE contact us directly via "Ask seller a question" link. We will respond within 1 business day or less.Your satisfaction is important to us.Thank you so much!